Con muchas ganas, invitamos a todos a participar en la presentación “Fe, Desigualdad, y la Búsqueda del Bien Común” a las 7:00 p.m., el jueves, 17 de noviembre en la iglesia St. John’s/San Juan de Austin. Lilia Martinez estará conmigo compartiendo su punto de vista acerca de estos temas importantes y corrientes. Más de una presentación, queremos adelantar una conversación que apoyará el bien común en esta sociedad. Lilia, anteriormente una organizadora comunitaria para Austin Interfaith, ha traducido la versión resumen de mi libro Just a Little Bit More. La versión en Español se llama Solo un Poco Más y detalla la importancia – por bien y por mal – de la plata en la sociedad estadounidense. El librito estará disponible por primera vez la noche de la presentación. El librito tiene buenas preguntas al final de los ocho capítulos para uso personal o para discusión de grupo. El entender la historia y la cultura de nuestra sociedad nos ayuda a construir un mundo mejor. ¡Que caminemos y trabajemos juntos en esta obra importante para este día de hoy y mañana! 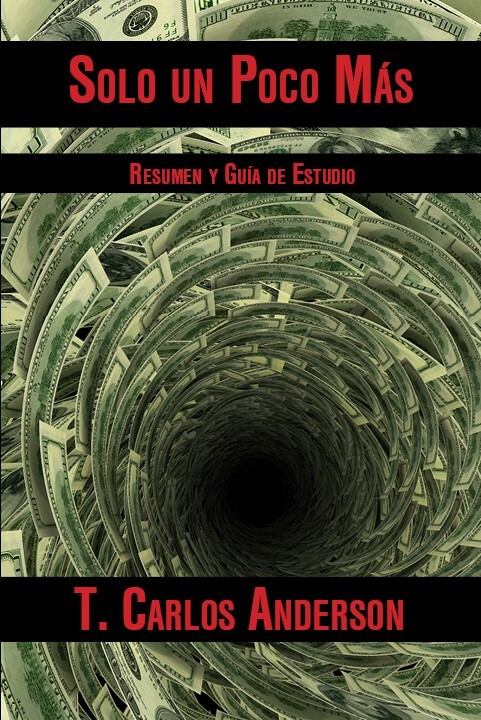 Solo un Poco Más: Resumen y Guía de Estudio está disponible muy pronto en Amazon, editorial ACTA-Chicago, y el sitio web de Blue Ocotillo Publishing. 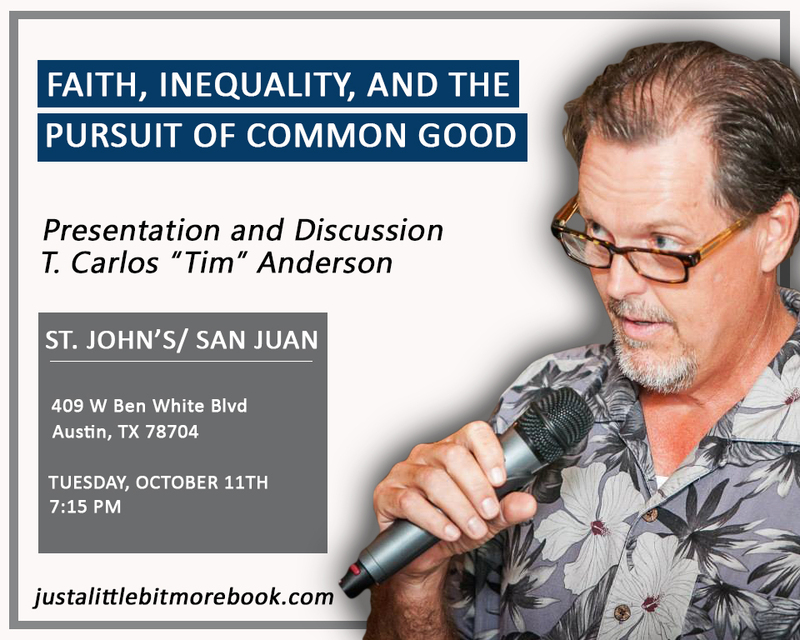 I’m looking forward to the fall season of presentations on “Faith, Inequality, and the Pursuit of Common Good.” I’ll be presenting in Austin and Beeville, Texas. 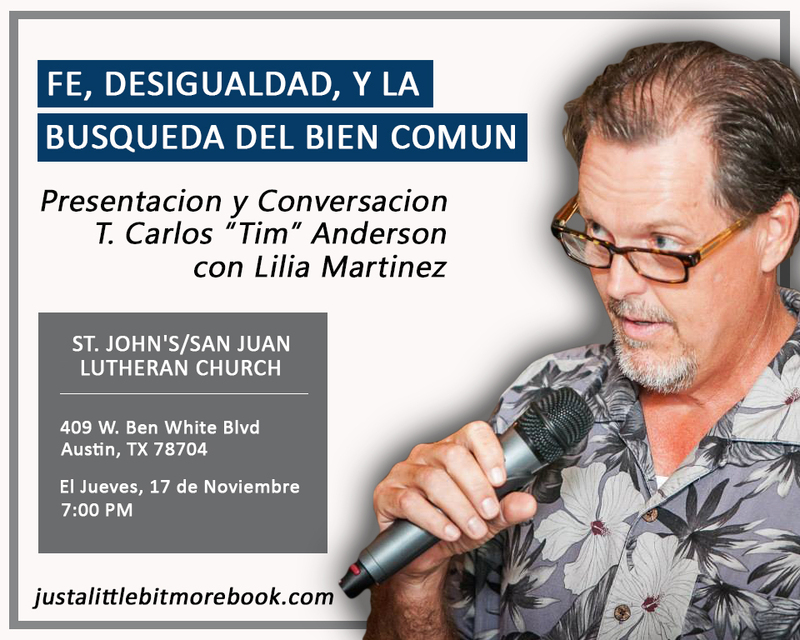 One of the presentations in Austin will be in Spanish (on Thursday, November 17) coinciding with the release of the summary version of Just a Little Bit More in Spanish. Solo un Poco Más, expertly translated by Lilia Martínez, reaches out to Spanish speakers with the goal of explaining the American cultural history of wanting and needing “just a little bit more” – both its positive and negative aspects. Legend says that John Rockefeller Sr., history’s first billionaire, was asked the question “How much is enough?” His purported answer aptly describes a widely accepted and practiced American way of life: “Just a little bit more.” American ingenuity, drive, and accomplishment – flowing from the spirit of “just a little bit more” – has made the world a better place many times over. When this spirit of attainment goes too far, however, social and economic inequalities exacerbate and common good suffers. The spirit of “just a little bit more” has its rightful place in American and other societies, but it must be harnessed. How can it best serve the common good? The presentation of “Faith, Inequality, and the Pursuit of Common Good” furthers my work that started with the publication of Just a Little Bit More: The Culture of Excess and the Fate of the Common Good in 2014. The fast-paced interactive presentation spiced with history, sociology, religious wisdom, and modern cultural understandings will introduce you to the Caddy Man and the Hungry Ghost – among others. You’ll be glad you came and I trust you’ll be inspired and encouraged to consider what you might do alongside your neighbor to uplift common good for community, society, and world. ¡El librito de JaLBM – llamado Solo un Poco Más – saldrá este Octubre de 2016!